NEWINGTON - In Wednesday’s win against Conard, the Newington boys volleyball team battled to victory in nail-biting fashion, winning each set by four points in a 3-0 sweep. The Indians made sure to make things a little less stressful on Friday evening against Enfield. Newington swept away the Eagles (0-2) to move to 4-0 on the young season, winning all three sets comfortably (25-10, 24-14, 25-18). The victory is the Indians’ eighth in a row against Enfield, with six of those wins coming by way of 3-0 sweeps. Newington had little trouble keeping the match to three sets, save for a brief battle in the second set where the score was 14-12 Indians, shortly before they rattled off a 9-0 run to win. 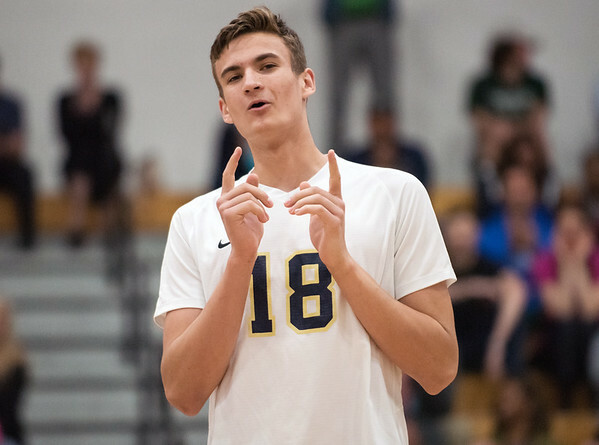 Fravel made sure the Eagles didn’t hang around too long by burying a set of service aces during the late Indians run, the second coming on the final point of a set, sparking a celebration from Fravel, who is used to making his impact at the front of the net. While Fravel admitted to a brief lack of focus in the second set, Newington had no such problems to start the match. The Indians started fast behind one of their reigning all-conference selections in senior Leonel Caceres, who snuck in a pair of service aces to immediately put Newington up 2-0. A block by Mason Romano minutes later made it 4-1 Indians, a lead that grew to 6-1, with half of the team’s points coming by way of aces. A long volley ended with a kill by Louis Egbuna to push the lead to 7-1 and force an Enfield timeout, which couldn’t settle the Eagles. Newington came out of the break with four straight, including a laser of a service ace from Jacob Baclawski to put the Indians ahead 11-1. Romano pounded down another kill later in the set off a perfect assist from Caceres to give Newington its largest lead of the game at 12 and cruised to a 25-10 win thanks to more powerful serving from Baclawski, who led the team with four service aces on the night. Enfield opened the second set with a pair of service errors to help the Indians build a quick 4-1 lead, but following an Eagles’ timeout, Enfield rattled off three straight points to creep within 10-6, but a big block up front by Fravel put Newington temporarily back in control. After a brief Eagles run cut the deficit down to two, Fravel’s unexpected serving prowess helped keep Newington’s goal of a sweep alive. The Eagles cured their early-set mistakes in the third by grabbing a quick 3-0 lead, but this time, the Indians didn’t wait to regain their focus. Ten straight Newington points gave the Indians a 10-3 lead behind the serving of Baclawski, as Burns began to empty his bench. The bench players immediately contributed, as a kill by Keenan Esau and an ace by Jasper Cayunda helped stall an Enfield run and put Newington ahead 13-9. Later in the set, a block and a kill Razik Amodou, also coming off the bench, made it 16-12. Posted in New Britain Herald, Newington on Friday, 5 April 2019 19:29. Updated: Friday, 5 April 2019 19:59.